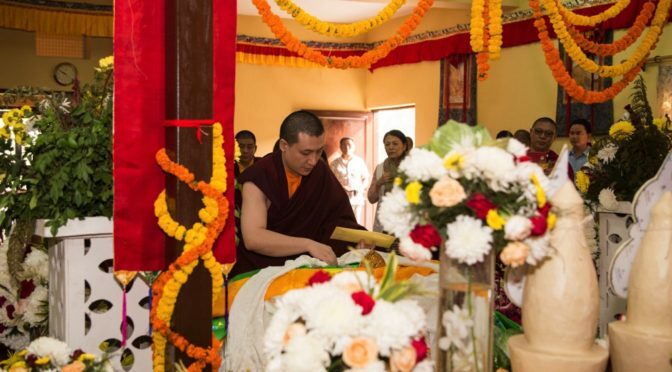 Thaye Dorje, His Holiness the 17th Gyalwa Karmapa, pays respect to His Holiness Jigdal Dagchen Sakya Rinpoche’s kudung (holy body). On the morning of November 9th, Karmapa visited the Sakya Phuntsok Palace in New Delhi in order to pay respect to His Holiness Jigdal Dagchen Sakya Rinpoche’s kudung and to offer his condolences to His Holiness’ spiritual wife H.E. Jamyang Dagmo Kusho. His Holiness Vajra Dhara Kyabgön Dagchen Rinpoche Ngawang Kunga Sönam of the Phuntsok Phodrang passed away on April 29th, 2016 at the age of 87 in Seattle, USA. His Holiness’ kudung arrived on November 7th in New Delhi for the final cremation ceremony on November 11th. His Holiness was considered a major spiritual leader within the world of Tibetan Buddhism.